"FANTASTIC" -- Great Location -- Free WiFi! "Fantastic" is verbatim how recent guests described our gem of a condo! Perfect spot for a couple's spa escape or the girlfriends' winery weekend. This lovingly maintained condo is centrally located just a few minutes walk to the Inn, The Copper Mine, The Edge, ski slopes and WTG-sponsored events. Enjoy the only private community pool on the mountain. Two bedrooms include a Queen bed in the loft and Twin beds in the first floor bedroom. New, luxury bedding and towels have been chosen with your comfort in mind. Extra room adjacent to the living room is perfect as a quiet reading nook or meditation room. Updated kitchen with granite counter tops and stainless steel appliances; it is fully stocked with every small appliance you might need. Newly-renovated bathrooms. No hidden fees; cleaning fees are included in your rental price! Enjoy the quiet from the second floor deck with gorgeous sunset views. This special place has been our haven from the hustle of everyday life and we hope you find the same sense of peace and relaxation. We look forward to hosting you! Private family home open for occasional rentals. 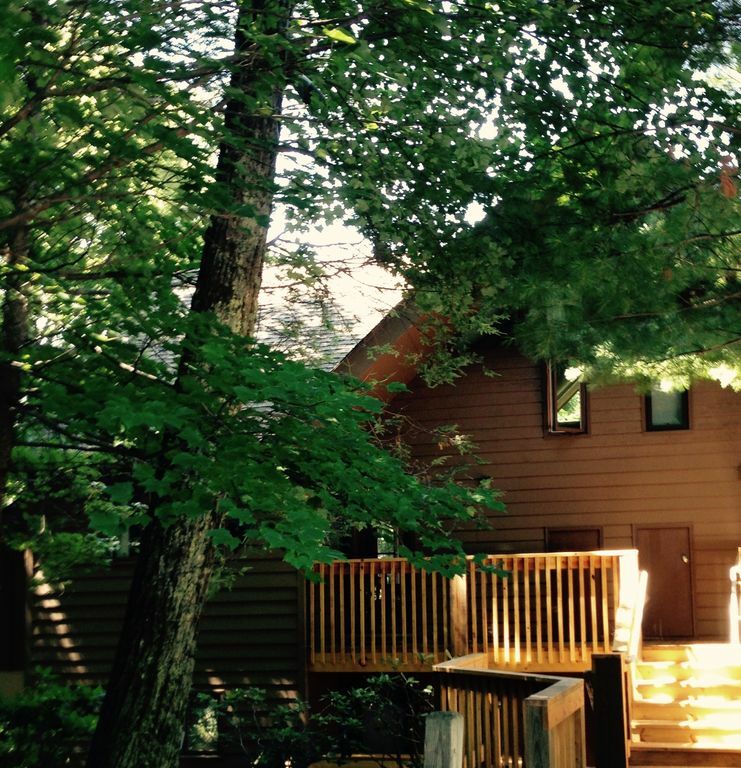 Quiet, seclude location a 3-5 minute walk from centrally located activities on the mountain. In the summer, enjoy the private community pool which is a 1-minute walk from our condo. Back deck offers privacy adjacent to a wooded area. You'll feel like you are the only people on the mountain! Fully-equipped kitchen with every minor appliance including blender and food processor. Pool is for exclusive use of our community. Lovely, close to the slopes, and so well stocked! We recently had a lovely weekend in this condo. Our ski weekend was interrupted by a full day of rain but it was hard to complain when we had a cozy warm and extremely well appointed place to be ... inside. The kitchen has every gadget you might need, the beds are comfortable, and the condo is a short walk to the slopes. Specifically, you probably would not want to walk it in ski boots, but easy in shoes. Many thanks to Bob, who was a terrific host and easy to communicate with. We certainly hope to be back. Thank you Erin. We are gratified that you found the condo well appointed and comfortable and we hope to host you again when it's not raining. Bob was very helpful throughout the stay. Nice condo close to everything. I forgot a few things at the house and the condo had everything needed that I left. We had some last minute changes with family members arriving later than expected and bob was more than willing to help and extend our stay. Great experience. Glad you enjoyed your stay and found the condo equipped with everything you might need. We hope to host you again. Bob was very accommodating with some last minute date changes and the condo worked out perfectly. Great location. We are glad it worked out. We appreciate your review and look forward to hosting you again. Very nice condo in a great location. I would stay here again. We're glad you enjoyed the condo and the location. We look forward to hosting you again! We thoroughly enjoyed the weekend. The Wilson's were the best owners I have ever dealt with. They have a very nice place and are great people to rent from. We're glad you enjoyed your stay and hope to host you again! This condo was perfect for our vacation. The location is fantastic and we never used our car. The walk to the slopes was short. The condo was clean and stocked with all we needed. Thanks for your feedback. We are glad the condo and location met your satisfaction. We think it's a special spot and we make every effort to ensure it has everything our guests could need. Hope to host you again!